Up to 12 sanctioned Mini-Tournaments [maximum of 1 such tournament per month on a ‘first-come-first-serve’ basis]. Refer to Annex A for the list of pre-requisites for Mini-Tournaments to be sanctioned. Satellite Leagues [that run for at least 5 months]. Refer to Annex B for the list of pre-requisites for Satellite Leagues to be sanctioned. To encourage and motivate both adult and young players to be participating and playing regularly in TFAS-approved tournaments. The ranking provides an incentive for them to keep playing the game so as to improve their game and hence their ranking. To provide both adult and young players an indication of their ‘cumulative’ performance in TFAS-approved tournaments and where they stand in relation to all participating players on an ‘on-going’ basis. To be used for promotional and marketing purposes to create awareness of the game in Singapore so as to attract more players to the game to grow the population base of active regular players. The total number of participating players in each tournament does not affect the number of ranking points awarded to participating players. Participating players shall not be penalized due to low participation rates. All participating players in each tournament shall be awarded a ‘base ranking points’ for participation. In addition, the top 8 players in each tournament [or top 4 players in the case of Mini-Tournaments and Satellite Leagues] (where applicable) shall also be recognized and further awarded additional ‘bonus ranking points’ commensurable with their tournament performance and placing. Note that this applies only to the TFAS Cup, National Championships, Merlion Cup, Mini-Tournaments and the Satellite Leagues. As the SGTFPL / SGTFCL / SGTFJL is a year-long tournament that requires higher levels of commitment and more regular playing time by its participating players, the ranking points awarded shall be more substantial relative to the abovementioned 1-day tournaments; likewise relative to the Satellite Leagues, as it is regarded as the National League where the top players in the country compete. Ranking points awarded to players shall be cumulative year-on-year. There shall be no ‘reset’ or ‘discard’ of previous ranking points awarded. When a Junior player no longer satisfies the requirements of the Junior category, the Junior ranking points previously awarded shall be converted into Open ranking points in a process termed as ‘graduation’ (refer to Section 4.4 for more details). Ranking points awarded for the Open category shall be more substantial relative to the Junior category. This reflects the relative strength of the 2 categories; and also facilitating and allowing for ‘graduation’ (refer to Section 4.4 for more details). A Junior player may also elect to play in the Open category of a tournament. This player shall then be awarded separate ranking points accordingly and be listed in the rankings of both categories respectively. Ranking points shall be awarded to each participating player in accordance to the table below. In the event of a tie in tournament/league placing, the total available ranking points (associated with each of the tied placing) shall be divided equally among the tied players, rounded down to the nearest 0.5 point or whole number. Each tied player shall be awarded with the same number of ranking points. Ranking points shall be awarded to each participating player based directly on the actual points tally earned by the player in the SGTFPL / SGTFJL. This is the same points tally in the League Table earned by each player (i.e. 3 points for a win and 1 point for a draw). This is applicable for both the Premier League (i.e. equivalent to Open category) and the Junior League (i.e. equivalent to Junior category). Participating players in the Premier League shall be awarded ranking points in the ‘SGR (Open)’; while participating players in the Junior League shall be awarded ranking points in the ‘SGR (Jnr)’. 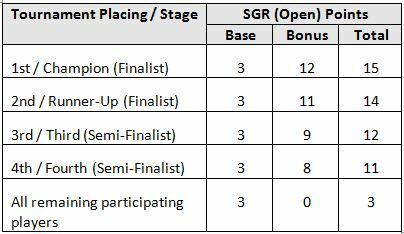 For the SGTFCL, as it consists of both adults and Junior players, the ranking points shall be awarded in the ‘SGR (Open)’. In order to reflect the relative strength of the SGTFCL compared to the SGTFPL, the ranking points awarded for the SGTFCL shall be pro-rated 50% (i.e. 1.5 points for a win and 0.5 point for a draw). Each player’s overall ranking points shall then be tabulated based on the summation of all the ranking points awarded to the player in all the tournaments that the player has participated in to-date. All players shall then be ranked in accordance to their overall ranking points awarded to-date; with players with more ranking points ranked higher than players with less ranking points. In the event of a tie in overall ranking points, each tied player shall be accorded the same ranking i.e. joint-ranking. Subsequent rankings that follow shall shift down accordingly. For example, if there are 3 players tied on 2nd rank, there shall be no 3rd and 4th ranked player. The next highest ranked player that follow shall be ranked 5th. When a Junior player comes of age and no longer satisfies the requirements of the Junior category, he/she shall be deemed to have ‘graduated’ from the ‘SGR (Jnr)’ rankings to the ‘SGR (Open)’ rankings. When this occurs, the Junior player shall be removed from the ‘SGR (Jnr)’ rankings and be added into the ‘SGR (Open)’ rankings. The player’s ‘SGR (Jnr)’ ranking points shall also be converted into his/her ‘SGR (Open)’ ranking points. 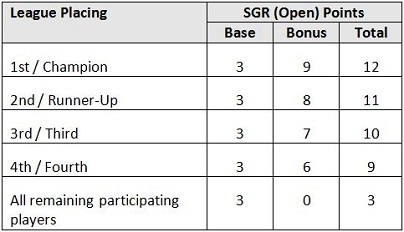 In the event that the player already exists in the ‘SGR (Open)’ rankings, the converted ‘SGR (Jnr)’ ranking points shall then be added to his/her existing ‘SGR (Open)’ ranking points. Graduation may potentially increase a player’s overall ranking points and boost his/her ‘SGR (Open)’ ranking. However, there is no anomaly here. In fact, this is intentionally designed to further encourage and motivate our young players to continue playing the game well into their adult years. The SG Ranking provides the most representative and indicative benchmark of players who are active in the Singapore Table Football scene. It identifies and provides due recognition to players for regular participation and good performance in TFAS-approved tournaments. Hence, it is the most definitive ranking of all active players in the Singapore context. 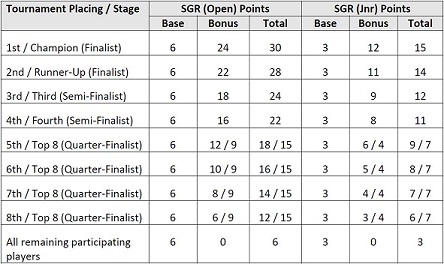 On this note, SG Ranking points are only awarded for participation in Tournaments and Leagues played in Singapore. For selection purposes to represent Singapore in regional and international tournaments. For promotional and marketing purposes to create awareness of the game in Singapore. Ranked players create a buzz; attract new players (both young and old) and are role-models to players learning the game. For identifying a group of committed young players to nurture and form the core of the next generation of Singapore players. With the implementation of the SG Ranking System, TFAS hopes to bring Sports Table Football in Singapore to the next level. Having a well-administered and regularly updated Ranking System specific to the Singapore context augurs well for Sports Table Football in Singapore. It is proof that the game is properly governed, organized and managed by TFAS in Singapore. For the love of the game!! 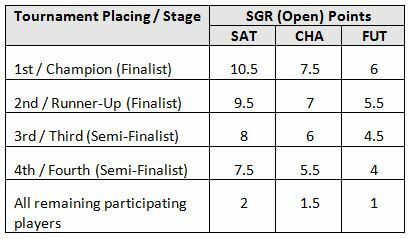 The following is the list of pre-requisites for Mini-Tournaments to be eligible for submission to TFAS for consideration to be included in the SG Ranking and for its participating players to be awarded SG Ranking points. The final decision for any Mini-Tournaments to be sanctioned rests solely with TFAS. 1. Tournament (without rank restriction) shall be open to all and shall not be closed, restricted or limited to a select group of participating players. 2. Tournament (with rank restriction) shall be open to all within the respective rank restricted category of Satellite, Challenger or Future as defined by FISTF. Such tournament shall be organized in accordance to FISTF guidelines with the exception of ‘wild card participants’. This is to ensure such tournaments really cater to the target group of players. 3. Organizers of the tournament shall inform TFAS (via tfasingapore@gmail.com) of their intentions at least 3 days before the announcement of the tournament. 4. Announcement of the tournament shall be made by the organizers at least 7 days in advance before the tournament date (if not rank restricted) or in accordance to FISTF guidelines (if rank restricted). Registrations shall be opened at the time of announcement. 5. The tournament shall have a minimum of 8 participating players. 6. Organizers of the tournament shall submit to TFAS (via tfasingapore@gmail.com) the full tournament results and a tournament write-up (including at least a group photo of all the players at the tournament venue) not later than 7 days after the tournament date. Incomplete submission will not be considered for SG Rankings. 7. Organizers at club level are responsible to submit their FULL SUITE of results (as in item no. 6) for all of their announced SG Ranking sanctioned tournaments. Failure to do so will result in the full omission of any other results for that year. The following is the list of pre-requisites for Satellite Leagues to be eligible for submission to TFAS for consideration to be included in the SG Ranking and for its participating players to be awarded SG Ranking points. The final decision for any Satellite Leagues to be sanctioned rests solely with TFAS. 1. The league shall be open to all and shall not be closed, restricted or limited to a select group of participating players. 2. Organizers of the league shall inform TFAS (via tfasingapore@gmail.com) of their intentions and the start date (1st match-day) and end date (final match-day) of the league at least 3 days before the announcement of the league. 3. Announcement of the league shall be made by the organizers at least 7 days in advance before the start date (1st match-day). Registrations shall be opened at the time of announcement. 4. The league shall have a minimum of 8 participating players. 5. The league shall run for at least 5 months. For each month, league table showing the players’ league position shall be captured for record purposes. 6. Organizers of the league shall submit to TFAS (via tfasingapore@gmail.com) all the monthly league tables (including at least a group photo of all the players at the venue) not later than 7 days after the end date (final match-day). 7. Ranking points are awarded after the final match day based on the final league position. 8. A player can only be awarded ranking points for a maximum of 2 leagues per calendar year. This is based on the end date of the league. Should a player participate in more than 2 leagues, then only the first 2 shall be awarded ranking points.